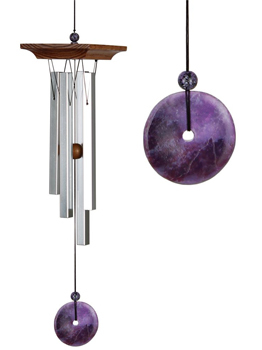 The enchanting sound of this chime is the result of a special tuning using the "Golden Ratio." This ratio, discovered by the ancient Greeks, can be found throughout nature. Amethyst is a purple quartz often used in jewelry. In ancient Greece, goblets were made of amethyst in the belief that it could prevent drunkenness. Amethyst has also been thought to heal people, so medieval European soldiers often wore amethyst amulets as protection.